Sunbury Motor Company – Sunbury Motor Company is providing us with a wonderful opportunity to raise more funds for the shelter. They’ve redirected a large portion of the monthly advertising budget to local charitable donations. They will donate $225 to designated non-profit organizations for each vehicle (new or used) sold through a referral program. New makes sold include Ford, Lincoln Mercury, Kia, and Hyundai. As mentioned, used vehicles are included in this offer as well. If you and/or your friends and family are considering a new or used car and you think Sunbury Motor Company may be the dealer of choice, please contact Cindy Shamp (570-473-1029) for a referral letter that will enable Mostly Mutts to receive the charitable designation, or you may download and print the letter HERE. This $225 is not an add-on to your purchase price. You don’t present the letter until your deal is completed, but the letter must be given at that time for Mostly Mutts to receive the donation. We will not get credit if it is turned in any time after the sale date. Many thanks to Sunbury Motor Company! Mostly Mutts has signed up to participate in fundraising with Community Aid Thrift Store on a six month trial basis. We will be reimbursed for cloth type donations (clothing, blankets, sheets, etc.) at the rate of $.04 a pound. Other items can be dropped off but we won’t get paid for them. Donations can be made at collection bins at four area locations: Zimmerman Dodge Motors (Sunbury), Brewers Outlet (Sunbury), Mertz Meats (Route 147 outside of Northumberland), and County Line Restaurant (Richfield). Initially, these bins will have an American Red Cross logo on them, until Community Aid Thrift Store has those with the Mostly Mutts logo in place. Do you shop at Boyer’s Market? If so, your purchases can yield funds for Mostly Mutts and it won’t cost you a penny. All you need to do is get a key ring scan card from us and present it when you check out. Mostly Mutts will get 1% of your total shopping costs excluding milk, tax, and tobacco products. Get a key ring at events, meetings, or contact Cindy Shamp @ 570-473- 1029 or Lynn Jordan @ 570-374-2989. Effective September 15th 2018: Purina is now no longer accepting weight circles. In place of the circles, they will now be accepting receipts from Purina food purchases. You can still continue to support Mostly Mutts by sending us these food receipts instead of collecting the weight circles. Please send your receipts to Cindy Shamp, 949 Point Township Drive, Northumberland, PA 17857. We thank you and the mutts thank you for your continued support, as every little bit helps. However, if you would still continue to collect the weight circles we would appreciate it. That way we will still have them just in case they become of use again. If you have trouble identifying these weight circles, please click HERE for a picture to help you. The weight circles can be sent to Cindy as well. You can show your support of Mostly Mutts by wearing one of our shirts! New shirt order in September 2017! Short sleeve t-shirts are available in solid and tiedye colors. Long sleeve shirts are available in tiedye colors. Hoodie sweatshirts are available in solid colors. Currently most shirts are available in Adult sizes only. Youth sizes are available in solid short sleeved t-shirts only. For specific information about available styles, colors, and sizes, please contact Cindy Shamp at (570)473-1029. Love shopping on Amazon? Now you can shop on Amazon and Support Mostly Mutts at the same time. Click the following link to visit our Amazon Smile page (our Amazon Smile Account is Mostly Mutts Inc). 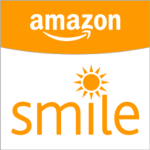 Amazon Smile is a website operated by Amazon that will donate 0.5% of the price of eligible purchases to help support the dogs at Mostly Mutts no kill shelter. Mostly Mutts has now been added to the Pet Rescue RX inc. website! 100% of their net profits go to animal shelters and rescue groups. Just shop online at http://www.petrescuerx.com for your pets prescription needs and select our group Mostly Mutts at checkout. Mostly Mutts volunteer Daphne asks that we don’t forget to call Purina @ 1-800-778-7462 once a month for the free $1.00 coupons for dog and cat food. If you do not use them yourself, please send to Cindy Shamp, 949 Point Township Drive, Northumberland, PA 17857 for use at the Mostly Mutts shelter. Visit chewy.com through this link https://www.chewy.com/rp/5309. Place your first order and Chewy.com will donate $20.00 to Mostly Mutts! Shop and help support the shelter. You can also go to Lewisburg’s Music in the Park on Wednesday evenings from 7pm-8pm to purchase items.